UPDATE: The Treo 700p has now been released. This particular Treo 700p is branded for Sprint and as such is a CDMA smartphone which is great news for Sprint subscribers but sadly means that there is still no clue of a next generation GSM Treo… According to previous rumours (below) of new Treo releases in 2006, the first GSM Treo is likely going to be offered by Cingular in the US and other carriers in Europe around April/May while a Treo 700p GSM version will have to wait until September. As previously reported (see Treo “Hollywood” = Treo 800p?) 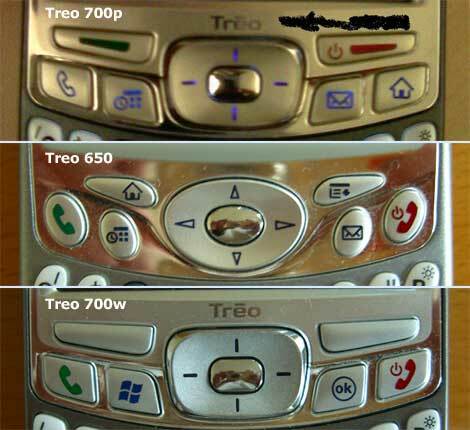 and now confirmed by these images, the Treo 700p shares the exact same casing as the Treo 700w running Windows Mobile. 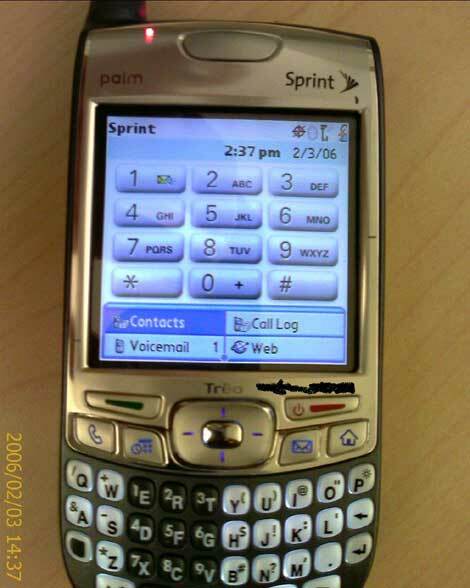 However, Palm appears to have changed the positioning of the navigation buttons (below) in the upgrade from the Treo 650 to the Treo 700p. Whereas the Calendar and Mail buttons to the left and right of the 5Way remain unchanged, the Call Answer, Call End, Home and Menu buttons have been shuffled into new locations – presumably after usability studies showed this to be better (?). So, is the 700p a worthy upgrade and something for Treonauts to get excited about? Well, I certainly think so! For starters, a faster UI and now enough memory to store _all_ of my applications is fantastic. Then there’s the _much_ faster wireless data connectivity provided by EV-DO and the improved 1.3MP camera. Finally, I really like the casing which I’ve had the opportunity to play around with on my own Treo 700w. 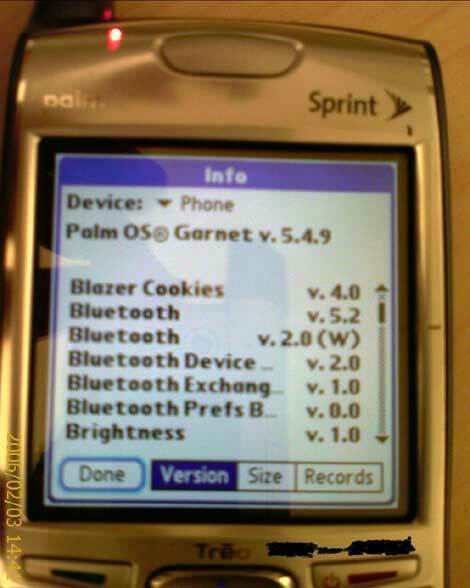 On the minus front, of course I would like to experience the next generation PalmOS instead of a Garnet revision but this is likely going to have to wait until 2007 and the lack of WiFi drivers (at least in this pre-production model) is also disappointing. Wow, this is welcome news. Finally some concrete news becasue I didnt want to believe the rumours fltting around about our new Treo. However, I was wondering if you know if the bluetooth is crippled on this treo as it is on the Treo 700w and whether or not this Treo has any any known changes in the basic software such as contacts, voicemail, calender, etc. btw, the person who had the "700p" gave it back to palm. no word if he got his money back. Wow! I see someone photoshopped the Sprint logo on this Treo. It's clear if you zoom in that someone's cut an pasted a Sprint logo over something else. Also, why does the screen say BT v2.0 and the write-up v1.2? It is a real phone. the bt 2 is the app version, 1.2 is the bt standard. Uhhhh, "rumored 800p" was a complete and total hoax. Although "Hollywood" rumor has a lot of credibility, there is no indication it will be called 800p, and the 800p rumor was fabricated -- the fabricator even admitted it. Can anyone explain what a 3g phone is in Layman's terms? Backing up what Joe said, I think it's important to clarify that the "800P" was completely made-up and there is no truth to that being "hollywood". Now, what that means exactly not even Shadowmite knows. It could mean that "Lowrider" is the CDMA version and "hollywood" is the GSM variant..but that's all guess work. In the end...we found out that there is a "new" device but in a lot of ways, the waters got more muddied. Guess we'll just have to wait and see...! Blake, 3g just refers to the "generation" of the network..in this case it's the 3rd. What's important to remember is that there is 1x and ev-do. 1x is what's on the treo 650 and other Sprint phones. Ev-do is an addon to that system (it's actually seperate from 1x)and give you DSL type speeds on your phone (though currently, upload much more limited to download speeds, this will be addresses in Rev.A in late 2006/7). Anyone else think this 700p phone isn't worth the upgrade? But it seems like they just modified the casing and added a couple of software upgrades. Oh, and the camera is higher res...but quality is never good on cell phone cameras anyway. This is hardly a significant improvement considering how long the Treo 650 was released. I'd really like something slimmer and a LOT more next gen to eventually replace my 650, but to me it just looks like Palm are just milking it. The Hollywood looks/sounds semi-promising but if it doesn't have Bluetooth 2.0 as well as built-in WIFI I'll be looking for Symbian phone to replace the Treo. 700p definitely sounds worth the upgrade to me... but then, I've only got a dinky Nokia phone with no wizbang features at all. It's enough better than the 650 to wait a couple more months, anyway. I'm kinda glad it's only running on a Garnet revision. Maybe it will be more stable that way. Will 700p have wi-fi add-on as SD card? Will 700p have script recognition? Will 700p be a laptop modem as well? I want a Treo 700 with the Windows OS on Sprint. It appears that Sprint is coming out with the 700P and that's the Palm OS correct? No plans for a 700W on Sprint? I would go with Verizon, but I have 5 phones on Sprint and a nice company discount. Does anybody know about the differences between the bluetooth speakerphones? As evidenced by the bluetooth ear pieces, not all are fully compatible with the Treo. I want one, but for $100+ I want to make sure that al the features of my Treo will work. Paul - the Treo 700w will not be available on Verizon until at least June/July. Thereafter it is more than likely that Sprint will offer it as well - in addition to the Treo 700p. Paul - not sure what you mean with 700w not coming out on Verizon until June/July - I presume you meant the 700 palm version. We've seen the adds for the $99 650 at Sprint now, so the new 700p will probably come in about 90 days. Trouble is, they want to sell all the 650's before introducing the 700p. Mid-summer at best. Does anyone know if the data service area for new 700p will be outside of centralized downtown large markets on Sprint? Verizon claims a much larger area. Where have you seen the treo for $99 from sprint? I have been checking the website every day...still at $499 -$150 for new activation and $50 palm rebate. I want to wait for the treo 700p...but work might dictate my getting a treo this month. I'd hate to get a 650, and have the 700 come out in 1-2 months. If I could get a 650 for $99, that wouldn't be too bad at all. Steve - you can find it for $99 from Earthlink (using Sprint+Verizon networks) and $149 from Sprint (both after rebates and 2 year contract). I have been with sprint for 8 years now...so I don't get any cool 'new contract' discount. Kind of makes me mad that these companies don't treat long time users any better. My phone bill was $160 a month for the past year or so, and from 70-100 the 6-7 years before. You would think they would have some 'loyalty' discounts for people. I guess I will just wait and see what work requires. If I have to spring for a 650 this month, I'll do it. I think it will suit my needs just fine. I just wish for a better e-mail and browser. If I have to get the 650 now, I will probably wait on the 700p, or until that newer smaller version with no antennae is launched at the end of the year.